House of Woyaks: Busy, Busy, Busy! 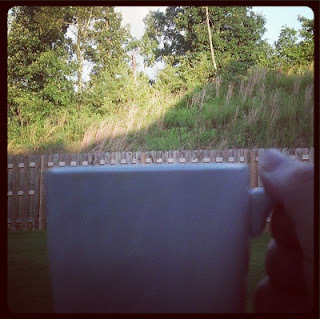 I feel like I just wrote about June coming to an end...and now we are a bit over half way through with July! 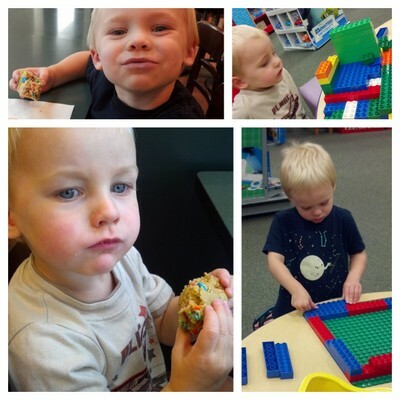 We had a few outings this week (and last). We have also made a few changes around the house as the summer moved along. They boys have been enjoying their bunks so much! But, as we have had them sharing a room once before, we knew what we were we getting ourselves into. We were hoping that they were big enough to know a bit better, but...well, being almost 4 and a bit over 2 is tough work. Luckily, I remembered this clock I saw a good while ago at Barnes & Noble. And, a few friends have been using similar types of clocks for their little ones. Have you heard of the OK to Wake Clock?? It is GREAT! While I was looking for the clock, Andrew and Alex played with the legos. 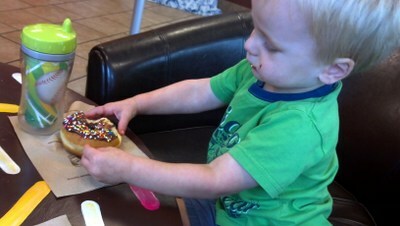 Afterwards, we headed over to the Starbucks and got a goodie. Funny story... I told that that B&N is really a grown-up store and the people like to read their new books and have coffee QUIETLY. I told them we could sit in the cafe, too, but they had to be really quiet. It was amazing... They whispered how good their M&M blondie was and how other mommies that were there had hair like me or a stroller like Alex's. It was so funny. 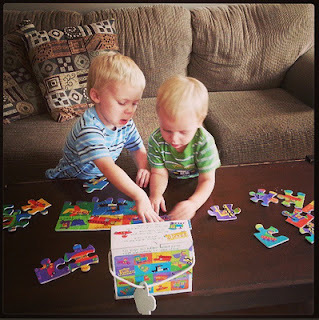 We may need to go there again when this mama needs the peace restored. And speaking of getting up early, call me crazy, but I'm getting back into it. I know, I know. Pregnant and all getting up early. But, you know...I need that morning quiet time to myself before I have to get on with the dad. I am back to enjoying that glorious cup of coffee without microwaving it 40 times. I actually HEAR the news instead of catching bits and pieces here and there. I love it. 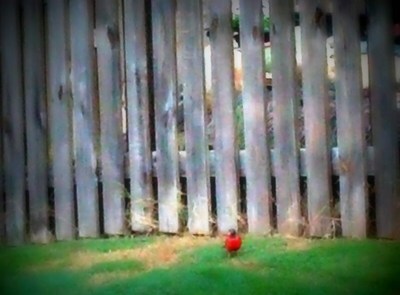 And while we are talking about birds...that sweet cardinal couple had some babies!! Here is one of their little boys who still has his fuzzy head, but that wonderful red coloring. He comes around all the time and his parents are usually sitting on the fence just watching him close by. Sweetest thing ever. 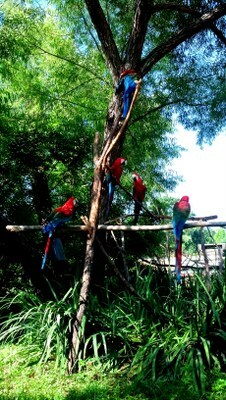 Gotta love a good macaw picture! Yep, we headed to the zoo - again! While we were there, look what we found!! A mama Guinea hen with her eggs. A LOT of eggs!! 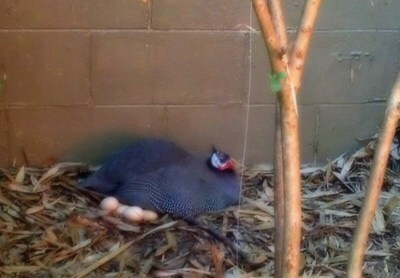 When we were back earlier this week, she and the eggs were gone and placed safely somewhere else. We are hoping to see some sweet little chicks in the future! 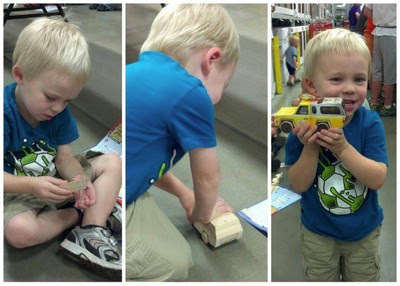 I read a post somewhere from a mom who took here little guys to Lowe's for the Build and Grow Clinics. Her kids were about Andrew and Alex's ages. The website says "recommended for 5 years or older." She was talking about how hers love building and such just like mine do. 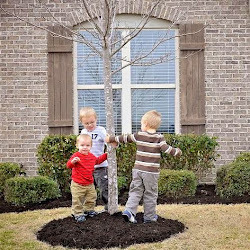 I read on to see that her kids loved it and said that really any age can do it. 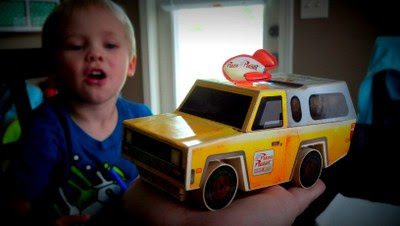 So, I signed up Andrew for last weekend's project - the Pizza Planet Truck from Toy Story! Perfect! I begged Jason to take some pictures for me and just look at my little builder man! He loved it!! Jason said that there were other kids there that were even younger and thinks that Alex will definitely be able to do it, too! 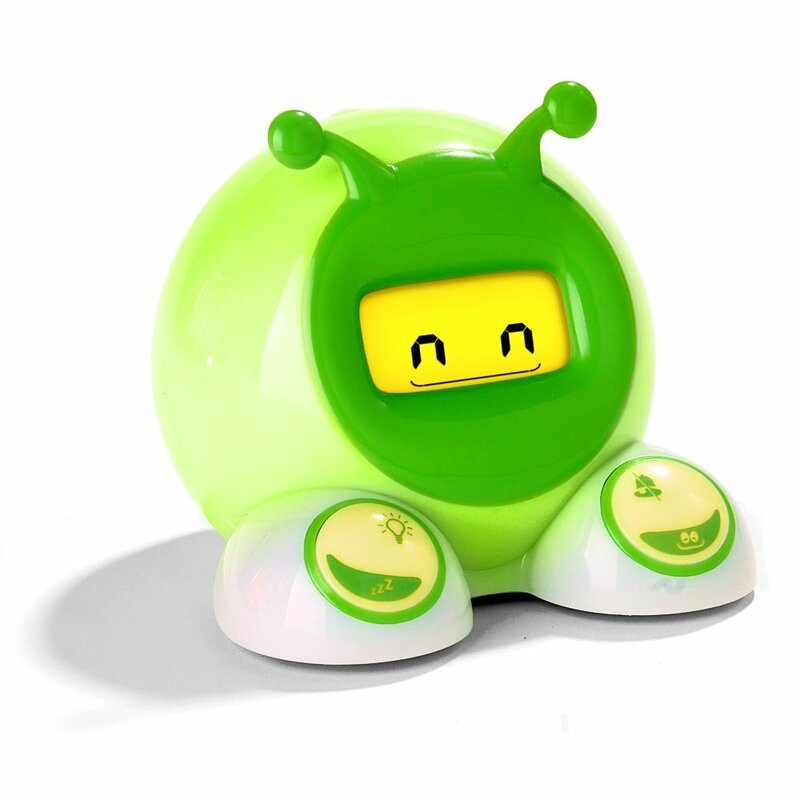 So, Alex is signed up for the next project - RC from Toy Story! YAY! 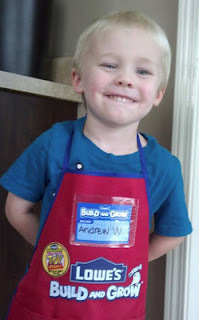 SUCH a cutie in his Lowe's apron - complete with his Toy Story badge for completing his project! Look how cool that is!! Thanks, Lowe's! Are you wondering where Alex was during all of this? A lot of fun went on last weekend. 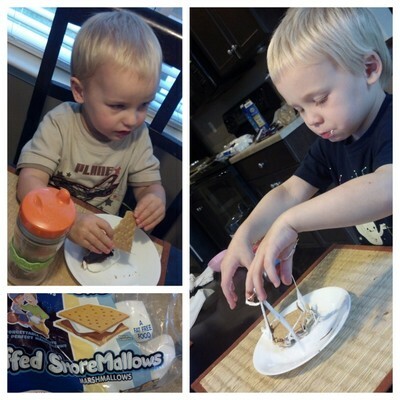 We made s'mores!!! YUM! This summer we have been working on their workbooks in between the fun and games. 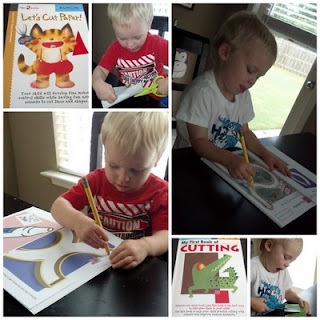 Alex is working on his cutting skills and tracing/easy mazes. Andrew is doing the same, just the next level up. Kumon workbooks are the best!! 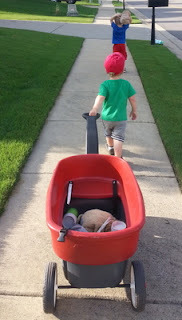 We have been going on our morning/evening walks, too.At the beginning of the summer they only wanted to do our street plus a few more steps down another. Now, we do the our street, the next one, and a few more steps. Puzzles are great, too! This is a gift from one of our friends who got to visit us while on a trip up here! Thanks, Jessi!! We have had so much fun these past two weeks, can you tell? 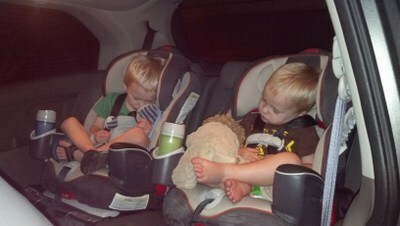 After parking in the garage and getting things out, they were STILL sleeping. And this isn't just one day...this has been happening for much more than that. Cracks. Me. Up. Especially, when I get closer to having two "Mr. I'm Not Tireds" in the House. I hope your summer is going great, too!